﻿ Your #GivingTuesday Fundraising Playbook » Red Mango Marketing! #GivingTuesday is November 27, 2018. #GivingTuesday is a global day of giving that takes place on the first Tuesday following the big holiday shopping days like Black Friday, Small Business Saturday, and Cyber Monday. #GivingTuesday in 2016 raised $177 million dollars online, 1.64 million gifts, and 2.4 million social engagements, bringing together participants from 98 countries around the world. In this guide, we’ll show you how to bring your fundraising online just in time for #GivingTuesday. We’ll give you a playbook that you can follow to end your 2018 fundraising on a high note, and extend your success into the New Year. Do you know a nonprofit that could benefit from this guide? Use the share buttons at the top of the page to share it with them via social media or email. Or tweet it now: Use this guide to help bring your fundraising online. Thanks @ConstantContact! Editor’s Note: This post was originally published in November 2015 and has been updated for relevancy and accuracy. 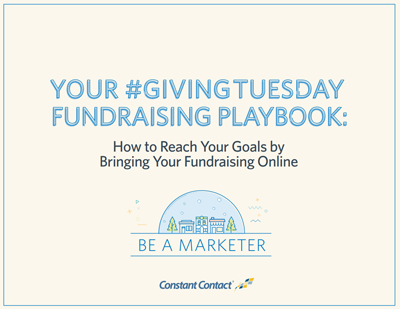 The post Your #GivingTuesday Fundraising Playbook appeared first on Constant Contact Blogs. This entry was posted on Wednesday, November 1st, 2017 at 8:00 am	and is filed under News & Updates, Nonprofit, Online Marketing. You can follow any responses to this entry through the RSS 2.0 feed. Both comments and pings are currently closed.